Georgia Law OKs Guns In Schools, Churches : The Two-Way The Safe Carry Protection Act, known to critics as the "guns everywhere bill," was signed into law by Gov. Nathan Deal. It is considered among the most permissive such measures in the country. 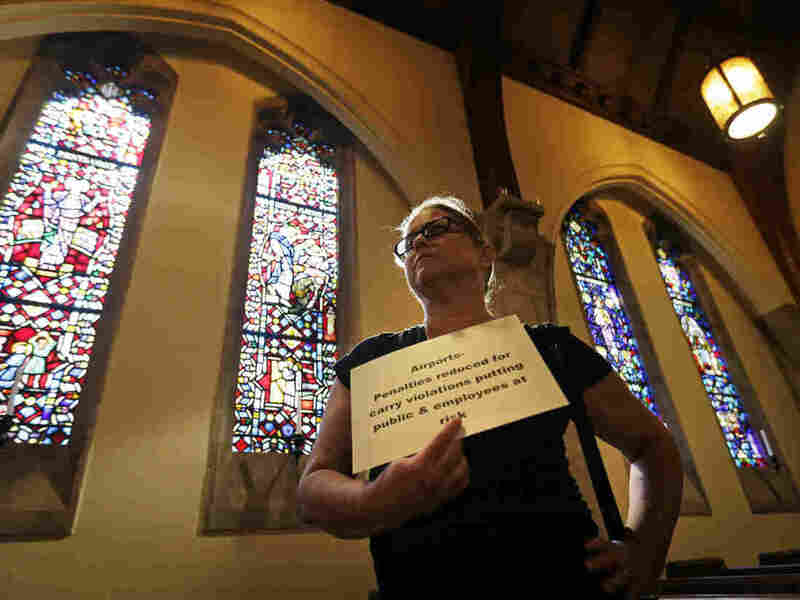 Andrea Teichner protests Georgia's new gun law at a rally at Atlanta's Central Presbyterian Church, on Wednesday. Georgians will now be able to carry firearms in such places as schools, bars, churches and government buildings under a sweeping new law signed by the governor on Wednesday. The Safe Carry Protection Act, also known to critics as the "guns everywhere bill," was signed by Gov. Nathan Deal, who said it will allow "people who follow the rules [to] protect themselves and their families from people who don't follow the rules. "The Second Amendment should never be an afterthought. It should reside at the forefronts of our minds," Deal said. The Associated Press says a few hundred gun rights advocates gathered to watch the signing. Others, opposed to the measure, held a gathering at Atlanta's Central Presbyterian Church. Georgia Public Broadcasting's Jeanne Bonner reports that the new law "also bars law enforcement officials from checking gun permits, which some say nullifies the licensing process." Under the law, school districts would be able, if they choose, to allow some employees to carry firearms. However, The Atlanta Journal-Constitution also says that according to a recent analysis, the law "could let felons use the state's 'stand your ground' rules to claim self-defense if they feel threatened." "Among the controversial proposals that didn't survive were the "campus carry" provision, which would have legalized the carrying of guns on campus, and changes that would have required houses of worship to allow guns unless leaders ban them. (Instead, religious leaders can "opt-in" to allow guns into their congregations)." The bill passed easily with bipartisan support, despite opposition from gun safety activists. Deal's Democratic challenger, state Sen. Jason Carter, former President Jimmy Carter's grandson, is among those who voted for it. A similar measure in Arizona, which would have allowed people in the state to carry guns into public buildings and events, was vetoed on Tuesday by Republican Gov. Jan Brewer.